Montréal audiences still remember Canadian baritone Desmond Byrne’s powerful portrayal of the title role in Alban Berg's Wozzeck, a co-production of the Banff Centre for the Arts and the Nouvel Ensemble Moderne, staged at the Monument National two years ago. In October of 1996 Byrne went to the Kammeroper, Vienna, to sing the role of Olin Blitch in the Austrian premiere of Carlisle Floyd's Susannah. 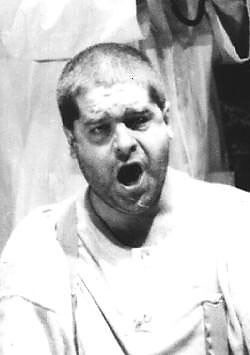 Early in 1997 American bass-baritone Dean Peterson, who was scheduled to sing Blitch at the Deutsche Oper Berlin, fell ill. Byrne was called to Berlin to cover the role. While in the German capital he coached the role of Olin Blitch with the opera's composer, Carlisle Floyd. During a stopover in Montréal in early May before returning to Berlin Desmond Byrne talked to La Scena Musicale about the Susannah experience. LSM: Tell us about the Vienna production. D.B. : I accepted the role because Brigitte Fassbaender was the director. I have always been a great admirer of hers. She purposely didn't try to make it American "à la Coca Cola." She wanted Austrian audiences to understand it. Her concept, which I thought very effective, was to set it in a puritanical Lutheran community. The Kammeroper is the third largest opera house in the city, but it is a small house seating 500, specializing in chamber opera. Floyd himself reorchestrated Susannah for a Mozart-sized orchestra, enabling us to perform the work in a small theatre. In such an intimate setting, with the audience so close to the stage, the greatest challenge was to be convincing as an actor. LSM: How was it received? D.B. Very well. All of the 17 performances were sold out, and I was fortunate to get good reviews. Austrians were pleasantly surprised by how approachable a work it was. LSM: Did the Deutsche Oper Berlin contract arise from the Vienna performances? D.B. Yes. When American bass-baritone Dean Peterson got sick they called me to do the rehearsals and to cover the run. Goetz Friedrich, director of the Deutsche Oper Berlin, had already seen me in Vienna so he had confidence in me. As it turned out, Mr. Peterson had a schedule conflict, so they offered me the May 16 and 19th performances and an option on several performances next year. The Deutsche Oper Berlin is a major opera house so it's a great opportunity for me. LSM: Carlisle Floyd’s Susannah premiered in 1955 and has been given more than 200 productions and 700 performances in the United States and Europe. Last year, the University of Montréal Opera Atelier mounted a wonderful production of Susannah. Why is Susannah only receiving its Viennese and German premieres now? D.B. : I think people are paying attention to the 40th anniversary of the work, and there is a growing European interest in operas in English, such as Stravinsky’s The Rake's Progress and Benjamin Britten’s operas. Europeans are increasingly curious about American operas and Susannah is perhaps the most remarkable of this century. Of course there are other American operas which have entered the repertoire, such as Floyd’s Of Mice and Men (1970), Robert Ward’s The Crucible (1961), and Douglas Moore’s The Ballad of Baby Doe (1956), but Susannah is uniquely approachable, highly dramatic, and musically beautiful. At times it almost has a Broadway feel to it, at times it’s like a Janacek opera. Susannah is a branch of the American musical tree that is new to the European public. In the United States Susannah has been given at the New York City Opera, Houston, Cincinnati, Pittsburgh, and San Diego, as well as at university-level music schools, though interestingly, next year will be the first time the Met does it. Susannah appeals to universities because it is short (actually shorter than Wozzeck), there are numerous solo roles, and the tenor lead roles - Little Bat and Sam - are not too long or high. Two acts mean only one intermission, though in Vienna we eliminated the intermission so that dramatically and musically the audience had an even more intense evening, and it was over early enough to go out and have a late dinner afterwards. LSM: During the Berlin rehearsals you coached with the composer. What was it like to work with Carlisle Floyd? D. B.: It is rather intimidating to walk into a room and realize that the composer of a major American work is sitting there. Floyd coached me for two hours on the role of Blitch, and it was a bit overwhelming having the man who wrote the work telling you what he wants. Though Mr. Floyd is over 70 years old and somewhat frail, he is very elegant and extremely intelligent. He is very alert to what you are doing and he has very definite ideas about the role. LSM: What were your feelings about the role of Olin Blitch? D.B. : Floyd said, "I don't understand why this opera is so often done at the universities. Susannah is as difficult as Tosca or Norma, which universities rarely attempt." The same is true of Olin Blitch. Olin Blitch is Wagnerian, very much a bass-baritone role. Vocally, I find it more difficult than Wozzeck. There are huge leaps and the orchestration is very heavy. Blitch is a terribly difficult role to sing, although musically it sounds simple. It took me six weeks to learn. LSM: What were Floyd's ideas about the work? D.B. : As you know, Floyd wrote both the music and the libretto, which is why the opera is so unified, and such a wonderful piece of theatre. He is completely devoted to conveying the plot through the "flavour" of the very claustrophobic ideas of the American south: the Southern Gothic esthetic, the religious conservatism, the almost tribal values of a closed society. Floyd’s certainty about his motivations and artistic decisons is thrilling in itself. Nevertheless, Floyd admitted that his ideas about the opera have changed somewhat since the fifties. He told us, "I wrote this in 1956 when I was a young man and I realize that I've learned a few things since then." For example, he rethought many of the metronome markings, which was a surprise. There were also some difficult dramatic changes that I couldn't quite figure out, but when he explained the logic it became perfectly clear. Basically, the opera is a story of intolerance based on parables taken from the biblical Apocrypha. He took the fable of the prodigal son and put Susannah in that role. The character of Olin Blitch represents a closed, intolerant, hyper-religious society. Susannah is a young innocent woman who shrugs off society’s disapproval by saying "That’s just their opinion. They don't really want to be mean to me." This is a quintessentially American attitude, as typical today as it was in 1955. Floyd's great strength as a librettist is that he writes about what he knows. As Floyd explained it, his composition is a folk opera representing post-Civil War society. Much of his music is based on hymn tunes and folk melodies, indirectly in the Singspiel tradition of Mozart’s Magic Flute and Weber’s Der Freischutz. His music creates the illusion of actually being in a conformist society and experiencing the difficulty of individual expression. The opera is also written in the dialect of the South, which is an essential aspect of the colour of the piece. He told us, "I want it as idiomatically correct as possible." In the first entrance of Olin Blitch "I am the Reverend Olin Blitch", Floyd slowed down the tempo that was being used. "I want it stodgy, slow, almost pompous," he said. It is like an old battle song or a revival hymn, very Civil War-era. It immediately conveys the straight-jacketed attitudes which Blitch embodies. He has religion, but he is a showman and also out to make converts. His façade is hard, but behind it you see the corruption and the frailties that will later destroy him. The big sermon in the Second Act, where Blitch tells a parable about a dying man who lived a life of debauchery, is marked "half sung". "In my opera there is quite a bit of spoken text, Sprechstimme, and also half-sung lines. When it comes to full singing, I want it to come from the spoken to the fully-sung text as if to say ‘Now do you get the point?’" The composer’s idea of color is not necessarily evident in the score, but in person he tells you how he wants it done. That is what makes performing interesting for me. LSM: So there were interpretive changes. Are these changes reflected in the published score? D.B. : The gist of Floyd’s coaching was "Yes there are editorial changes and some musical corrections from the first to the second printing, and there are some things I would want to change in the score, but it is expensive to make a new edition so it is better to leave well enough alone, as it doesn’t affect the impact of the work." Desmond Byrne’s most recent appearance in Montréal was with I Musici de Montréal in March 1997 as the baritone solo in a performance of Landowski's Leçons des Tenebres. He will give a recital at CAMMAC (Lake MacDonald) on Tuesday, July 29. He next performs in Montreal in September 26th as part of the McGill / Alumni Series. Discography: Carlisle Floyd: Susannah. Kent Nagano; Choeur et Orchestre de L’Opera de Lyon. (Cheryl Studer, Samuel Ramey, Jerry Hadley, David Pittsinger, Della Jones). Virgin Classics 7243 54503924. Carlisle Floyd ‘s "Of Mice and Men " will be staged at Glimmerglass Opera, Cooperstown, New York, from July 26 to August 24, 1997. Floyd will be giving a seminar on August 16 entitled "Portrait of the ‘30s: Inspiration for an Opera" at the Fenimore House Museum, N.Y. State Historical Society, Cooperstown, N.Y. For more information on the Glimmerglass Opera season, telephone (607) 547-2255. Fax: (607) 547-1257. http://www.cooperstown.net/glimmerglass.